Click to learn more about the Nashville Number System book, or to learn more about the INCLUDED CD-ROM. $39.99 - download only. Available on iPhone, iPad, iPod touch, and Mac. 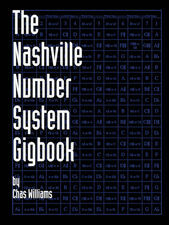 Click to learn more about the Nashville Number System Gigbook. $0.99 each- download only. Available on iPhone, iPad, iPod touch, and Mac. $18.99 - download only. Available on iPhone, iPad, iPod touch, and Mac. Click to learn more about the Nashville Number System. Click here to view AUDIO AND CHART SAMPLES from the Ring of Fire CD! Click here to viewAUDIO AND CHART SAMPLES from the 1511 CD! Download The NNS from iTunes for your computer or iPad. Includes songs playable with each chart example. Play along or watch as you listen to the chart! 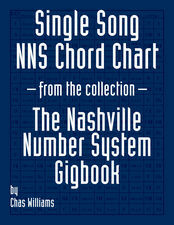 The Nashville Number System Gigbook. Available as a download for computer or iPad! CUSTOM CHARTS: Custom charts of your song written by Chas. If you're not sure how to write a number chart for your song, or if you have questions about this service please email for details.